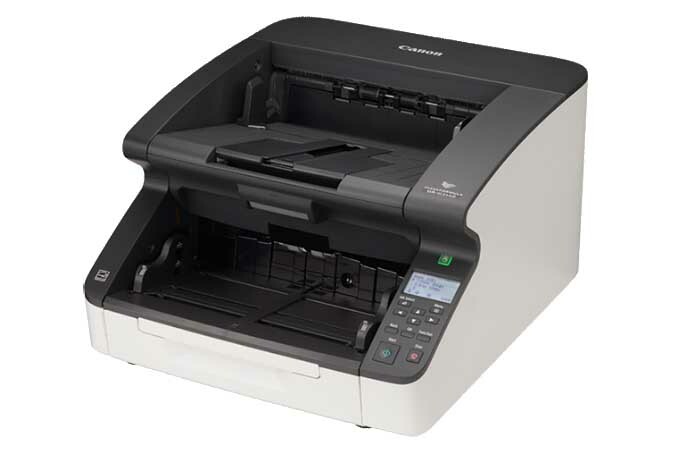 The Canon imageFORMULA DR-G2110 production document scanner, with both USB and ethernet connectivity, provides businesses with a high-performance, reliable, and flexible scanning solution as part of a robust document management system. The DR-G2110 scanner handles up to 110 pages per minute— both sides in a single pass*—and holds up to 500 sheets in the ADF. The DR-G2110 scanner features an intuitive control panel that allows easy access to scanner settings, and user-programmable job buttons for one-touch operation. Equipped with a motorized paper feed tray that can be adjusted to the height of the batch, and flexible paper feed and output guides. This, plus the ability to handle a variety of document types,** allows for unattended batch scanning, which can help optimize workflows and increase efficiencies. The DR-G2110 scanner is registered EPEAT gold and meets ENERGY STAR® guidelines for energy efficiency.